As I settle into my new home in Kang, I have frequently reflected upon my original expectations about joining the Peace Corps. I envisioned living in a small home (or hut? ), with no running water, no electricity, and limited access to local resources. I imagined walking hours to work every day, finding myself completely isolated, and sending snail mail to loved ones to tell them about my adventures. However, the amenities and luxuries I thought I would live without are now available to me on a daily basis. My home is incredibly beautiful and much larger than anything I would ever need as a single woman. I traveled all around the country this weekend to get the Internet as well! I can now use the Internet whenever I want to from the luxury of my own home. Just how exactly did that happen? After spending 550 Pula (Botswana currency… this is over 1/4 of my living allowance), 74 hours of travel, 6 bus rides, and 6 taxi rides, I was able to purchase a two year contract to use the Internet. It is basically a modem that plugs into a USB port and allows you to access the Internet. It logs your data usage and I pay each month to use a set amount of data. Convenient, right? Of course, I never imagined that I would have Internet on my personal computer as a Peace Corps Volunteer, but some of those luxuries are available simply because of the times we are living in and the fact that I am serving in a middle income country. Before I moved to Botswana, I was told that Botswana was known as a "Peace Corps Light" country. What exactly does that mean? It means that some people view this country as a comfortable place to live in with many luxuries and resources available, unlike other counties of service. Seems accurate thus far in my service…. After gaining independence in 1966, Peace Corps Volunteers served in Botswana from 1966 to 1997. In 1997, the Peace Corps recognized how far the country had progressed and saw no need to stay and serve the Batswana (this is what you call people from Botswana). Botswana's economy was improving and they were considered a middle income country. What a great reason to have to leave a country of service! 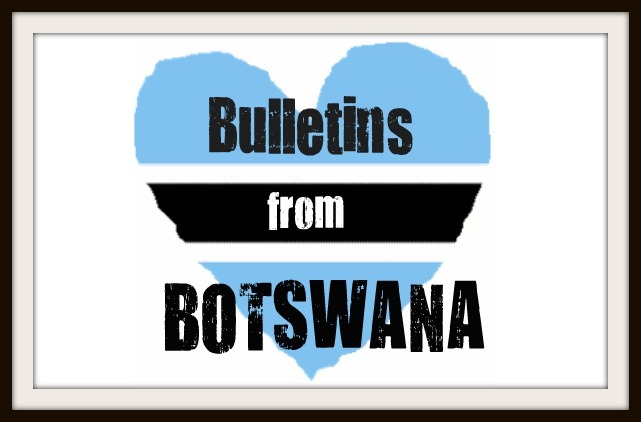 In 2001, the idea of returning to Botswana was brought about by the severity of the AIDS epidemic in the region and the potential of the epidemic to reverse the prolific development gains made in Botswana since independence. The president asked for Peace Corps to come back and in 2003 Peace Corps started sending over more volunteers to address the issue. There have been over 370 volunteers who have served since re-opening in 2003. Currently, we have over 115 volunteers throughout the country working at District AIDS Coordinator Offices, Clinics, Non-Governmental Organizations, and schools. Compared to where I would have been living in Guatemala (with my first Peace Corps assignment), I definitely do have access to things I never thought I would. In Guatemala, as well as other Peace Corps countries, projects are often designed to make some sort of direct, measurable impact. I was assigned to the Healthy Homes Program there and I would have helped assess how to make changes to homes to create a positive change for the people who lived there. It would have been a very obvious change...just look at the house! In contrast, I am here in Botswana now to measure whether or not I can make a difference in the fight against HIV/AIDS. It's not possible to determine whether you made a direct impact because behavior change isn't something you can measure very easily. I'm here to do as much as I possibly can and I am very blessed to live in such a wonderful country. I am happy to be able to enjoy some of the luxuries I imagined living without, but I am also dealing with some extremely tough issues without really being able to observe any direct results. I am envious of some other volunteers living with less and witnessing a change in their communities, but I wouldn't trade my situation for anything else in the world. It's so devastating to see well-educated people living in a successful country becoming ill from a virus that is easily preventable. So although I may find myself with more than some Peace Corps Volunteers in other countries, I am battling an extremely complicated epidemic that has affected millions of people for the past several decades. Trade-offs.